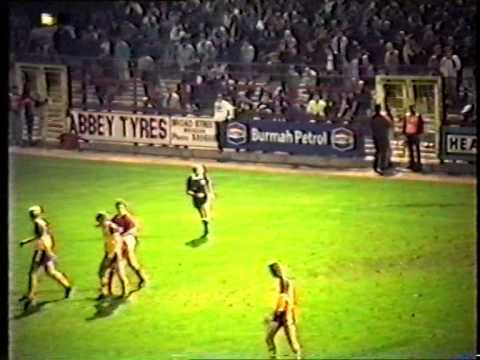 Though the two clubs now enjoy an intense local rivalry, competitive clashes between Swindon and Oxford only started in 1965, three years after the U's were elected to the Football League to replace the bankrupt Accrington Stanley. 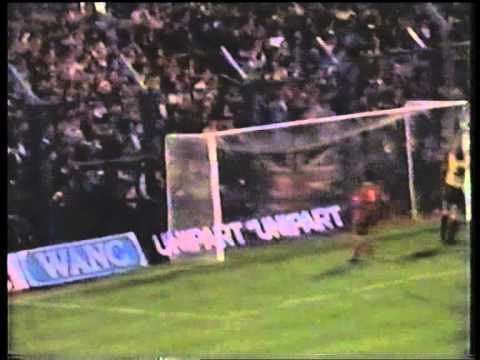 Many of the opening encounters between the sides were cagey affairs, with just nine goals being scored in the first ten matches, six of which being scored by the Town in two 3-0 victories. 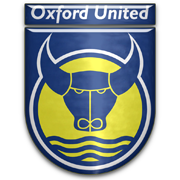 Of those ten games, six ended as goalless draws, and Oxford failed to score in all but two of the games - their first goal against the Town coming in the sixth match between the sides. 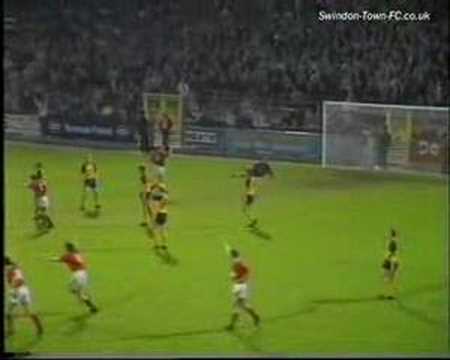 When Oxford finally registered a victory against Swindon at the eighth time of asking, it was an ignominous exit from the League Cup for the Town - the 1-0 defeat at the Manor Ground ending their defence of the trophy, having won it the previous season. 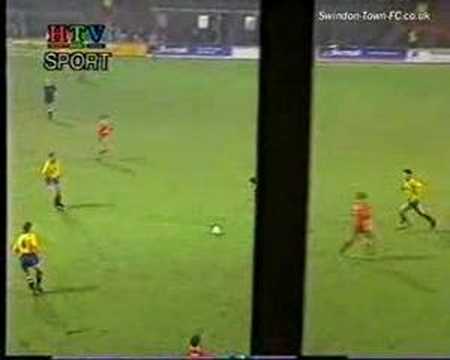 Since then, Swindon have maintained an impressive record over their local rivals. 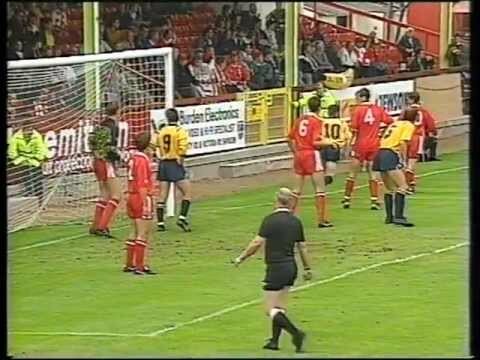 Few players have been transferred between the two clubs over the years - though one of the most controversial happened in 1995, when Joey Beauchamp returned to the Manor Ground from Swindon for �75,000 - a loss of more than �700,000 on the price they paid just fourteen months previously. 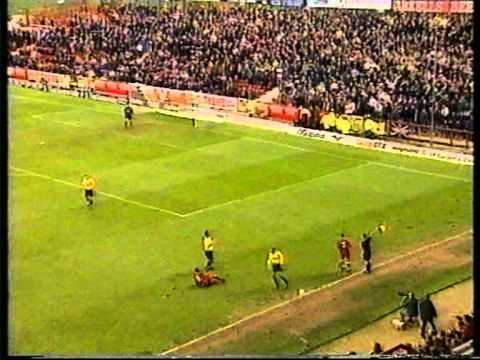 In June 1993, Beauchamp joined West Ham from Oxford for �1m, but after just 58 days at Upton Park, he decided that the commute to East London from his Oxford home was untenable, and Swindon boss John Gorman took his chance to bring him to the County Ground after being thwarted by the Hammers in his previous attempt to sign him. 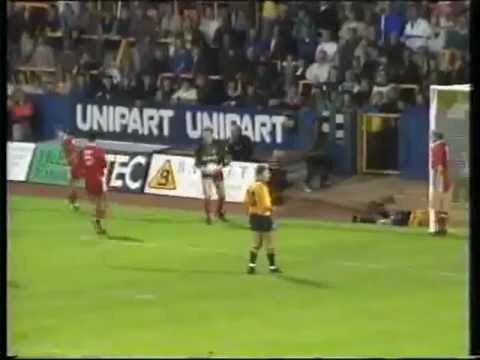 Beauchamp eventually joined for a deal worth �800,000, with Town defender Adrian Whitbread included in the deal - but he failed to impress at Swindon, and made just sixty appearances before being sold back to Oxford in a cut-price deal by Steve McMahon, who very obviously didn't appreciate his style of play. 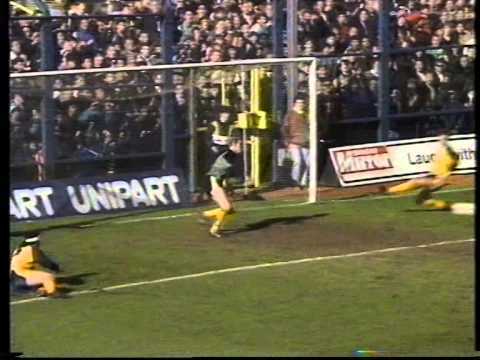 Beauchamp was to score past the Town in the next meeting between the sides - a 3-0 win for Oxford over the Town - and the season ended with Swindon champions of the Second Division and the U's in second place. 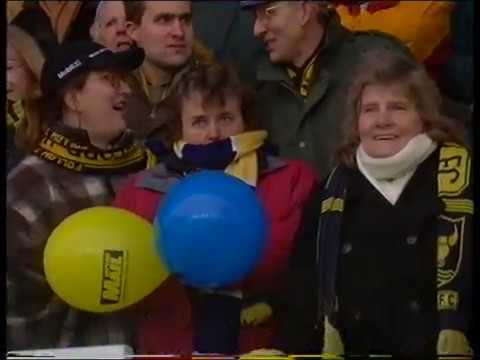 The Town give themselves a chance of avoiding relegation with a 3-2 win over local rivals Oxford - the headlines are made on the terraces though, as crowd trouble mars the game. 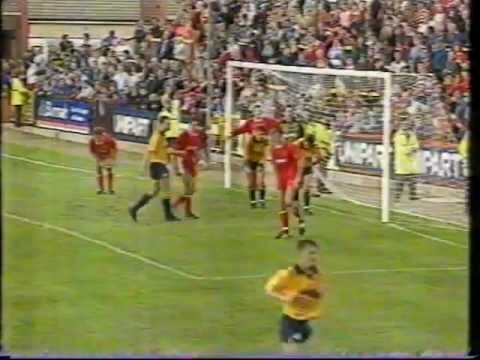 Dean Saunders gives Oxford the lead with barely fifteen minutes remaining in the local derby - but Tim Parkin levels matters just a minute later. Full match coverage as the Town storm to a 3-0 win over local rivals Oxford. Off the pitch, the fans sign petitions against ID cards - on it, the Town storm to a 3-0 win over Oxford. HTV coverage of the 3-0 derby win over Oxford. The Town record a comfortable win over local rivals Oxford - Colin Calderwood opening the scoring, before Steve White nets a brace to wrap it up. Central News coverage, as the Town record a comfortable win over local rivals Oxford - Colin Calderwood opening the scoring, before Steve White nets a brace to wrap it up. An end-to-end encounter, the Town twice come back from behind to draw at the Manor. The Town give Oxford a two goal start, and then put them to the sword with a four goal blitz. Swindon are lucky to escape with against their local rivals - Oxford hitting the woodwork twice in a goalless draw. After a 3-3 draw, Town win through in the much maligned competition on penalties. 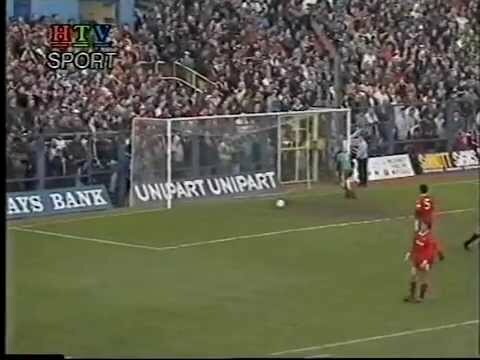 David Kerslake scores his first ever Town goal in a 2-1 derby win. 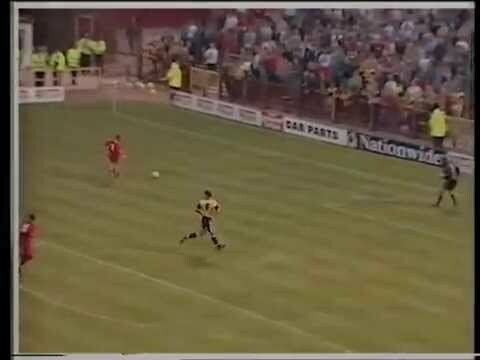 Missing Micky Hazard, Martin Ling and Ross MacLaren in midfield, Swindon make the short trip to the Manor Ground - but despite taking the lead early on through Shaun Close's fortunate strike, Oxford go on to record a 5-3 victory - their first win over the Town in ten years. A second string Town side comfortably sees off their local rivals in the Anglo-Italian Cup. 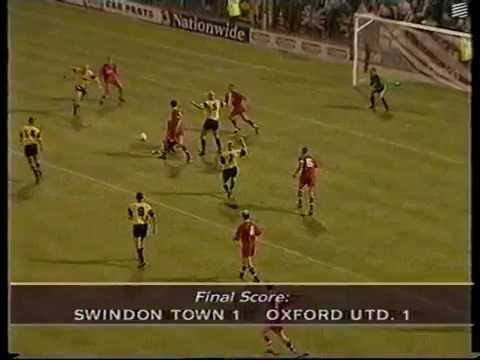 For the second home game on the trot, Swindon twice take the lead against local rivals, only to be pegged back by a late equaliser - this time Martin Ling and Shaun Taylor net for the Town, Andy Melville and David Penney for Oxford. 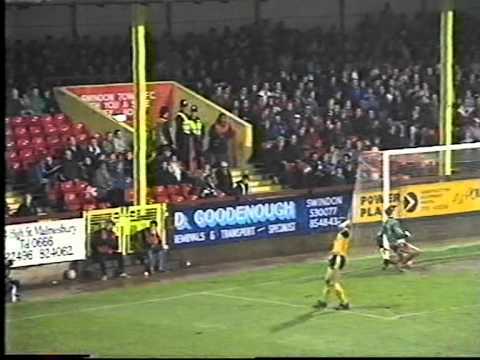 Steve White scores the winner at the Manor Ground. After failing to register victory in their last five games, the Town get back to winning ways at the Manor thanks to Steve White's goal-line poaching. 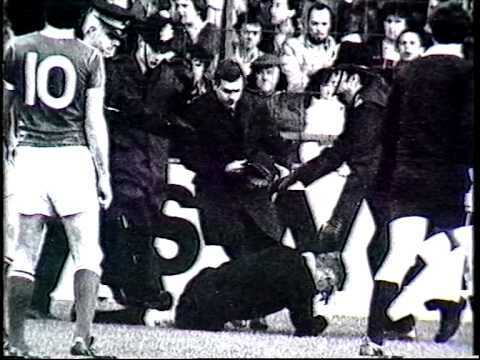 Joey Beauchamp gets by far the best reception of his Town career, when he enters the fray as a late substitute against his former club Oxford - Wayne Allison's first half goal cancelled out by Paul Moody. One of few black marks on a superb season - Swindon don't perform at local rivals and fellow promotion chasers Oxford - and have to suffer when McMahon reject Joey Beauchamp scores their third and final goal in front of the away support. 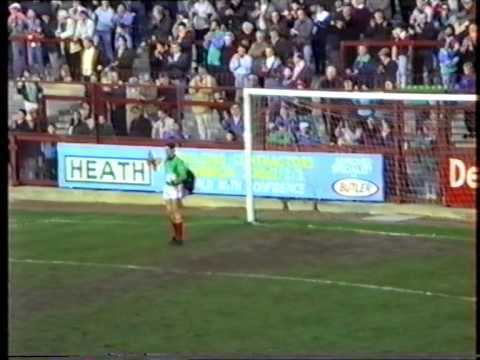 On his return to the County Ground after his move back to Oxford, Joey Beauchamp receives some fearful stick from the Swindon crowd, not to mention a few bumps and bruises from his ex-team-mates. 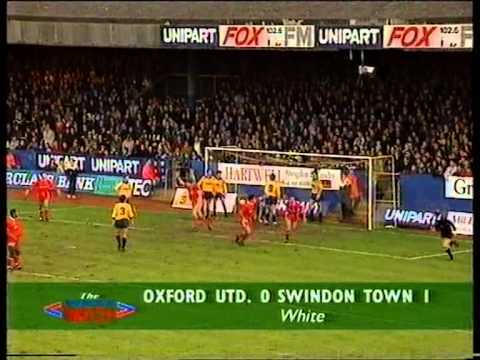 After putting their whole squad on the transfer list due to financial difficulties, Oxford travel to Swindon for a local derby - Swindon resident Mike Ford putting them one up. 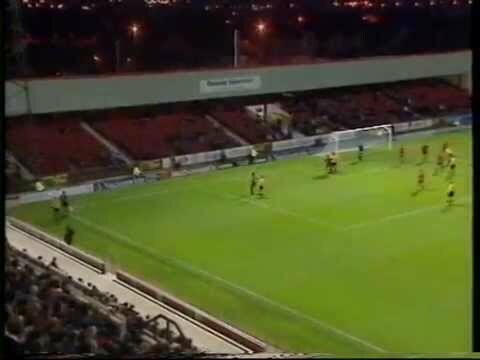 Despite the off-field turmoil, Swindon make it a week to remember on the pitch - having already beaten Bristol City, they record their second 4-1 win over Oxford in their last two visits to the County Ground. 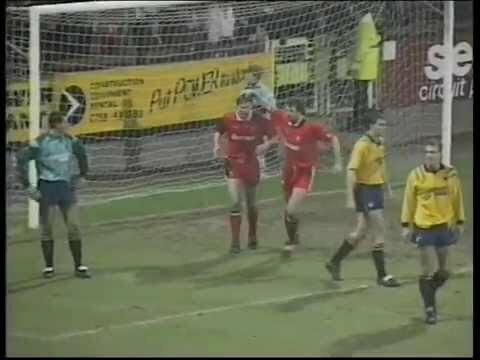 Despite the off-field turmoil, with 25 programme sellers being sacked before the game, as well as eight other redundancies to backroom staff, Swindon make it a week to remember on the pitch - having already beaten Bristol City, they record their second 4-1 win over Oxford in their last two visits to the County Ground. 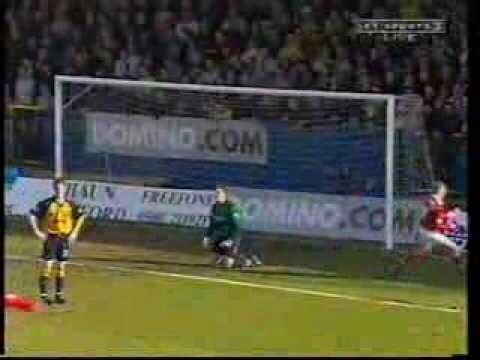 A Dean Windass double - the first from the a controversial penalty - gives Oxford a 2-0 win in the A420 derby. Two superb strikes from Steve Robinson give Swindon the points in an ill-tempered local derby at Oxford, who have two players sent off - the defeat leaving the U's 22 points from safety. 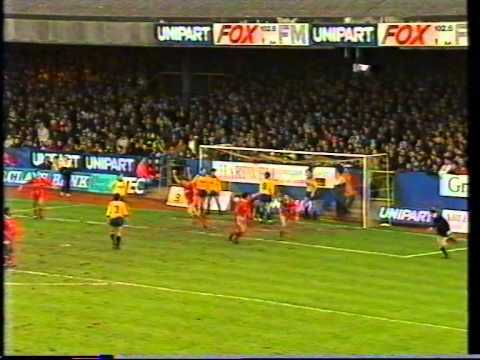 The Match of the Day audience are treated to an awful, drab local derby in the rain at the Kassam Stadium - Jefferson Louis' scrappy goal a fittingly bad winner. 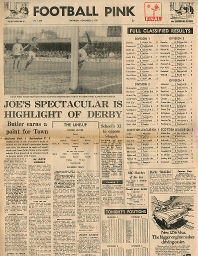 Click to view a newspaper report of Swindon's 3-0 win against Oxford United in the 1966-1967 season. 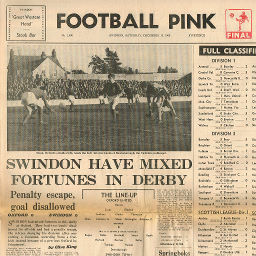 Click to view a newspaper report of Swindon's 0-0 draw against Oxford United in the 1969-1970 season. 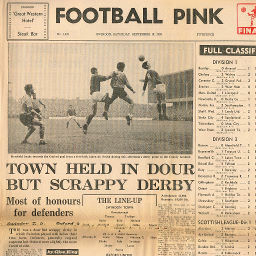 Click to view a newspaper report of Swindon's 0-0 draw at Oxford United in the 1969-1970 season. 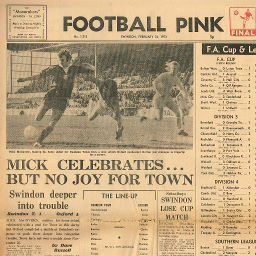 Click to view a newspaper report of Swindon's 0-0 draw at Oxford United in the 1970-1971 season. 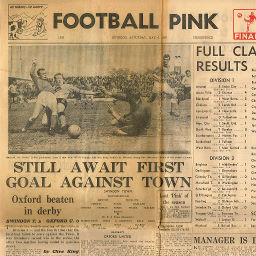 Click to view a newspaper report of Swindon's 3-0 win against Oxford United in the 1970-1971 season. 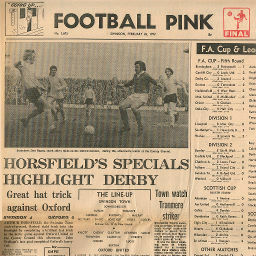 Click to view a newspaper report of Swindon's 1-1 draw at Oxford United in the 1971-1972 season. 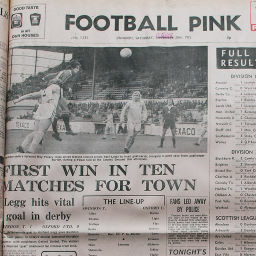 Click to view a newspaper report of Swindon's 4-0 win against Oxford United in the 1971-1972 season. 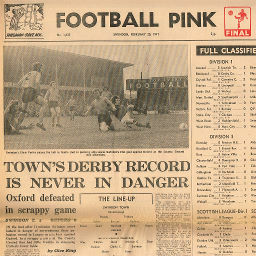 Click to view a newspaper report of Swindon's 0-1 defeat at Oxford United in the 1972-1973 season. 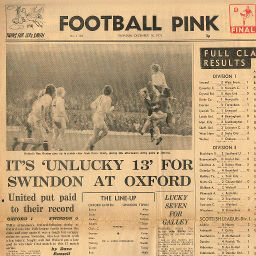 Click to view a newspaper report of Swindon's 1-3 defeat against Oxford United in the 1972-1973 season. 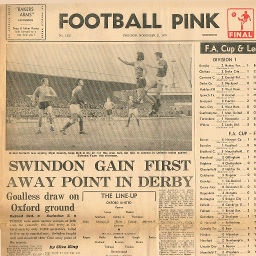 Click to view a newspaper report of Swindon's 1-0 win against Oxford United in the 1973-1974 season. Match played at King Edward's Place, Wanborough. Match played in three periods of thirty minutes, behind closed doors. Match played in three periods of thirty minutes, behind closed doors.